The American Library Association designates a week in April as Preservation Week. The goal is to connect with and educate our communities on ways to preserve our collections. Georgia Law has a particularly rich and deep historic collection but those historic resources need special care if they are to be preserved. 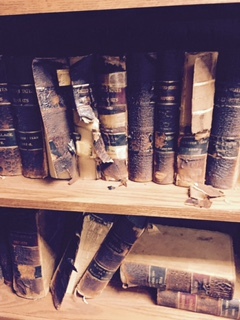 An in-house unit here at the Law Library works on repairs to cloth-bound and paperback books. An outside conservator has been working with our leather bound items. In a lengthy lead-up to Preservation Week, April 24 – April 30, 2016, we will highlight the skills of these individuals and demonstrate the possibilities of preservation by restoring a significantly damaged historical collection. During workshops in December 2015 and February 2016, we will open the process for public viewing. Any treatment or repair process must be minimally invasive and aesthetically pleasing in addition to restoring structural integrity. We will demonstrate how that’s done and display special techniques and materials. We will also be on hand to answer questions. The collection of 170 restored items will be presented to the Dean during Preservation Week. The first workshop is Tuesday, December 1st beginning at 2 pm. We will be working in the library basement to minimize transport of the fragile items and to contain the mess. Everyone is welcome to drop in and view the process of preservation. This entry was posted in Events & Training, In the Building, Just News and tagged book repair, preservation, Special Collections. Bookmark the permalink.